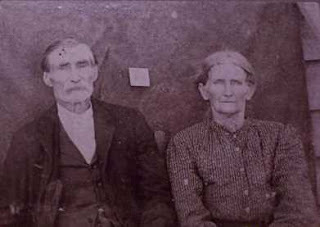 Charles Alexander Taylor, third child of John and Eliza (Cagle) Taylor, was born in Hardin County, Tennessee on January 24, 1834. His birth place is recorded on Union soldier pension documents and provides proof that the Taylor family lived in Hardin County, Tennessee before settling in Winston County, Alabama. His name first appears on a federal census for Hancock County, Alabama (later known as Winston). Listed as Charles Taylor, age 16, he is the oldest child living in the household of 10 people. At the age of 23, Charles married Louisa Jane "Sis" Curtis on February 19, 1857 at the home of the bride's father, Solomon Curtis. Two brothers of Louisa Jane also married Taylor sisters. On October 12, 1863, Charles Alexander went to Glendale, Mississippi and enlisted in the Union troops of the 1st Alabama Volunteer Calvary, Company L. He and his brother, Andrew Jackson Taylor, served in the same unit. Many Winston County men joined the Union troops to show their opposition to War of the Rebellion. Their father, John, was a leader in Winston County who boldly spoke about his loyalty to the United States government. Later in Charles' life, he filed for a pension which he was eligible to receive for his military service. In those pension files can be found information regarding his family and life in the war. One eventful story unfolds through the documents Charles submitted. Following orders given by Colonel Dodge to recruit new members for the company, Charles and a few other men set out on Christmas Day of 1863. When they were near Jacinto, Mississippi, the men were shot by bushwhackers causing their horses to stampede. Charles' horse made a quick bolt to the left and caused him to be thrown into the pommel of the saddle causing a painful rupture to his groin. This injury which gradually grew worse troubled him for the remainder of his life. Charles was separated from his unit and unable to return, according to documents in the pension file. He recorded that he hid out in the bushes to keep from being shot at by rebels. After a few months, Charles was able to return to his unit. He was treated by the Regimental Sergeant for his injury. His file also revealed that a march from Glendale, Mississippi to Jasper Alabama led his troop of soldiers within ten miles of Charles' home in Ellaville. His captain advised him to go home and take to the woods to prevent capture by the Rebels. Charles recorded that he was treated in the woods by Doctor Bird and DeGraffenreid. His discharge date for his service was May 1, 1864. At the age of 47, Charles was named first minister of Liberty Grove Baptist on October 8, 1881. He was very active in the Clear Creek Baptist Association. Another brother, James Knox Polk Taylor, also became a Baptist preacher. On January 7, 1916, Charles died at the age of 81. In his last days he was cared for by sons, John Frank and Lewis Monroe Taylor. Charles is buried in Curtis Cemetery, along with his wife Louisa Jane. CHAS A. TAYLOR, CO. L, 1 ALA. CAV. My grandmother told me a story about her great-grandfather who grew up in Winston County. She said he was found in the woods after his family had been killed and was taken in by the Taylors. After hearing this story, I started doing genealogy and saw that The Taylors were quite a prominent family in Winston Co.! Unfortunantly, I haven't been able to find anything about my ggggrandfather. He was born around 1849 and shows up on the 1850 census (Hancock County, then) as living with the Williams but my grandmother remembers very precisley that he accredited the Taylors. Do you have any stories of one of a Taylor taking in an orphaned boy between 1850 and 1860? He would've been under 10. His name was John Hand. If you have anything at all, I would love to hear from you. Thank you! On the 1870 Federal Census, there is a mysterious "John Taylor" listed as a 15 year old living with John and Eliza Taylor. John & Eliza are 63 and 64, respectively. The family does not know who this 15 year old is. He has never been identified as a child of John & Eliza through any family oral tradition or records. That's the only clue I have. We have corresponded through emails previously. Sorry I can't be of more help. Thank you for your comment.